This past February, I had an interesting but tough conversation with my oldest son Philip Jr., who is now 5 years old. During Black History Month, my wife and I told him that we would be telling him about great black leaders, Marcus Garvey being one of them. On this particular day, he had reminded me that I hadn’t shown him the video about Garvey yet. For one reason or another, I kept forgetting. So finally, my persistent little guy got daddy to make good on his promise. He climbed into my lap and I clicked the YouTube app on my phone, searching for a video appropriate for a 5-year-old to watch on our desired historical figure. We lucked out and found a 4-minute mini-documentary on Garvey which I thought would be perfect for a pre-kindergartener’s attention span. As we watched the video, Philip Jr. asked me “daddy, why is the commentator talking about white people?” I think he couldn’t figure out what role white people played in “black history.” I struggled to find the explanation that would adequately suffice for his current level of understanding—especially since the only mention of the word white in the documentary was connected to white supremacy, something very negative. This topic was not the jumping off place for a discussion on white privilege and the power that comes from it that I wanted to have with my 5-year-old. As a dad, I do my best to paint humankind in the best light possible to my kids in order to not jade their developing worldview and perspective. With that said, I had to respect my little guy’s intellect because Philip Jr. has been aware of race and ethnicity since the age of about 4½. He’s a very sharp kid—I’m led to believe it’s genetic! So I still had to come correct. After some thought, I was able to come up with what I hope was an accurate explanation that I felt he could relate to. Both Philip Jr. and I are superhero buffs. So, I began explaining: “Son, at times, the power used by people in government, big companies and organizations are kind of like super powers. There are some people who can be heroes because they choose to use their power for good and others who can become villains, using their power to hurt people.” In this way, I did my best to express how power dynamics work in the U.S., specifically around race and white supremacy, without using those terms directly and without leading him to believe that white people are superior to black people (i.e. the super hero complex) nor that all white people chose to use their power for evil. What I hope he took from our conversation is that people who have power can make the decision to use it to help rather than harm other people. At that point the conversation shifted from race to talking about actual superheroes, much to my relief. This was a hard conversation to have because I want my kids to afford everyone the same appreciation and respect no matter their skin color. Unfortunately, our society still places a very high premium on white skin and I’m often hardpressed in trying to explain this to my five-year-old without exposing him to all of the negative reasons why this is. I’m not in a rush to tell my sons that their ancestors were enslaved by white people under U.S. Government sanction for over 246 years, even though one day I will have to. I will also have to explain the many lingering after-effects wrought by that point in our not-so-distant history. I have anxiety just thinking about it. As difficult as these conversations are, it is imperative that we as a collective have them and do our best to facilitate them in a respectful yet authentic way. Processing the conversation I had with my son has given me an even greater appreciation for the work that I am a part of at Greatheart. For one, we are helping those with power and privilege effectively use it for the good of everyone impacted by it. And we are doing it in a way that shows them that they don’t have to lose in the process. There is a common misperception that touts: in order for one group to win the other has one to lose. This isn’t the case and we are laying this fallacy to rest when we help our clients leverage the diversity on their teams so that individuals thrive and businesses can better reach their objectives. Additionally, we are slowly but surely making it safe to talk about race in the corporate space—and lets face it, discussing race in the workplace is very difficult for most of us. If I struggle to have these types of conversations with my 5-year-old, the pressure is ten-times more when discussing it with my peers and colleagues even though I get paid to do it! As difficult as these conversations are, it is imperative that we as a collective have them and do our best to facilitate them in a respectful yet authentic way. It’s easier said than done because the seemingly everlasting wounds around race are so pervasive, insidious, and can be salted with the lightest touch, even if unintentionally. Still, we must have these conversations. If we don’t, whether in our homes, communities, businesses, or places of worship, we will never heal together. One of the toughest truths to come to grips with in this challenging conversation is this: Blacks and whites must heal together in order for there to be any healing at all. Why is this? Because both sides have been negatively impacted by the effects of racism, albeit in different ways. With that said, I believe for this crucial conversation to happen, both blacks and whites have to get good at listening to each other. One of the things that we emphasize and strive to practice here at Greatheart is Listening to Build Trust. When we listen to build trust, we keep a powerful leadership promise: we hear what colleagues and customers actually mean. We show our respect, we build relationships, and we collaborate more effectively. But it is a step toward the healing process. In my view, the way of our conversations (as a U.S. collective) about race play out goes a bit like this; black people (myself included) get angry and voice our hurt and pain. And rightly so, we’ve got a lot to be angry and hurt about; the unjust and disproportionate killings of black people by police, the wealth/opportunity gap between whites and blacks, black unemployment rates, and mass incarceration are utterly unacceptable and continued work must be done to solve these issues. However, please hear me on this, when we (black people) come only with a pointing finger and not an ear to listen, white people on the receiving end become defensive and either stonewall or deny the black experience in the U.S. altogether. As biased as I am as a black man — one who is very in tune with his blackness — I can understand their reaction even if I can’t always stomach it. I can understand one group being defensive against another if they feel they are the recipients of a one-way attack. I also understand that this is a loaded statement because many of us (black people) feel we are attacked every day due to systemic inequalities. With that said, I don’t think most (there are exceptions I know) white people wake up in the morning thinking about how to make life harder for black people. As a husband, I have a habit of becoming incredibly defensive when my wife criticizes me, even if the criticism is warranted. I then share these criticisms with my male friends who feel the same way that I do when they are criticized by their wives. It may feel good in the moment when my friends agree with me, letting me feel like I’m right, but no ultimate progress is made in my relationship with my wife. My view has remained one-sided because I haven’t done the work necessary to build more trust with her by listening with an open heart and mind. At the same time, there are some things we simply have to do together, because as much as some of us may not like it, we share the same planet with ever-increasing proximity. The result of finger-pointing and stone-walling is that no one gets heard and the path to healing is blocked yet again. From my point of view, we’ll never get anywhere with this approach. The status quo will carry on, tensions will continue to escalate, and no progress will be made in our communities, businesses, nation, and most importantly, our very own humanity. I do believe that there are some aspects of the healing process that we as black people have to put in motion. There are things that we want to do ourselves, we are already doing, and only we can do. At the same time, there are some things we simply have to do together, because as much as some of us may not like it, we share the same planet with ever-increasing proximity. Just to reiterate, I’m under no illusion, I know this is hard, hard, hard, hard, (one more time for the people in the back) HARD WORK for both sides! 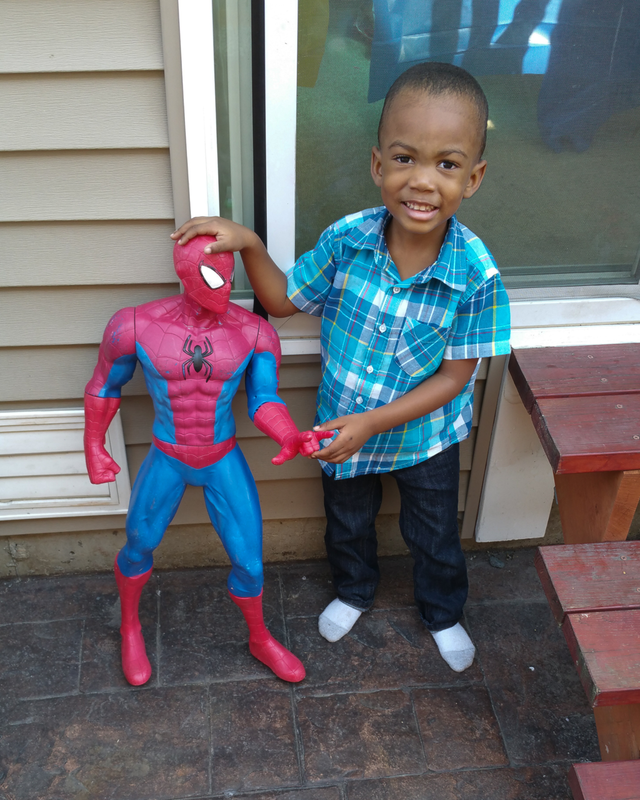 At the heart of what I’m trying to teach Philip Jr. is what Uncle Ben said to Spiderman, “with great power comes great responsibility.” In this social media age, we can see that the days of power without accountability are coming to a close at lighting speed. Leaders, influencers, governments, institutions, anyone with power, no matter their background, will be best served and serve others best by using their power, privilege, prestige or whatever name we call it, for the good of all and meaning it from the heart. Did I mention that this was hard work?